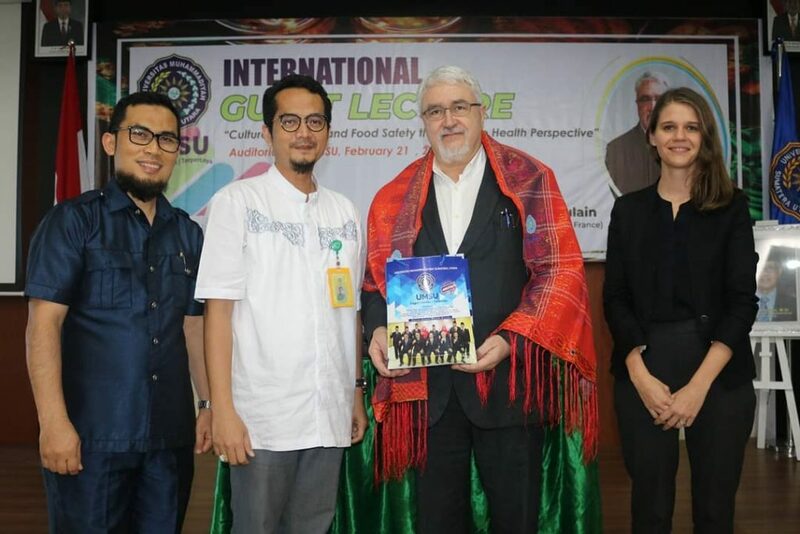 LKUI dan FK UMSU, bekerja sama dengan Institut Français Indonesia dan Alliance Française Medan menyelenggarakan kuliah umum internasional pada hari Kamis 21 Februari 2019 di Fakultas Kedokteran UMSU dengan menghadirkan pembicara yaitu Prof. Jean-Pierre Poulain dari Université de Toulouse Jean Jaures, Perancis. Adapun tema yang diangkat pada kuliah umum tersebut yaitu “Culture, Nutrition, and Food Safety through One Health Prespective”. Kegiatan ini dihadiri oleh Dekan Fakultas Kedokteran UMSU Prof. Dr Gusbakti Rusip beserta jajaran staf, Ketua LKUI UMSU dr Eka Airlangga, direktur Alliance Française Medan Anne-Lise Mercier, Dosen FK UMSU, dan mahasiswa UMSU. UMSU office of global engagement and cooperation, UMSU Faculty and Medicine, Institut Français Indonesia and Alliance Française Medan conducted an International Guest Lecture in theme “Culture, Nutrition, and Food Safety through One Health Prespective” on Thursday 21 February 2019 at UMSU Faculty of Medecine. The speaker of this guest lecture is Prof. Jean-Pierre Poulain from Université de Toulouse Jean Jaures, France. It is attended by Dean of UMSU Faculty of Medicine Prof Dr Gusbakti Rusip, and staff, Director of UMSU Office of Global Engagement and Cooperation, dr Eka Airlangga, Director of Alliance Française Medan Anne-Lise Mercier, UMSU Lecturer, and UMSU Students.